(CNN) -- Argentine singer Mercedes Sosa, known as "the voice of Latin America" for her songs about the plight of the poor, died Sunday, according to an announcement on her Web site. She was 74. 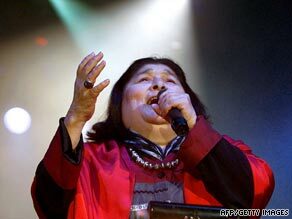 Argentine singer Mercedes Sosa died at a Buenos Aires clinic and had reportedly suffered from several ailments. "On this day, in the city of Buenos Aires, Argentina, we must inform you that Mrs. Mercedes Sosa, one of the greatest artists of Latin American popular music, has left us," the Web site said. Sosa died at a Buenos Aires clinic, and had suffered from liver, kidney and heart ailments, the Washington Post reported. Born on July 9, 1935, in San Miguel de Tucuman, Argentina, Sosa produced 40 albums during her musical career, and performed at places such as the Sistine Chapel at the Vatican and New York's Carnegie Hall. She also served as a UNICEF goodwill ambassador for Latin America. "Her voice always carried a profound message of social engagement through folk-roots music, without prejudice," according to the Web site. She formed part of the New Song movement in Latin America, which combined folk song traditions with contemporary music that often featured political messages in its lyrics. When a military junta took over Argentina in 1976, many of her albums were banned, and Sosa left in exile to Paris, France, and Madrid, Spain. She returned to her homeland in 1982. Sosa won various Latin Grammy awards. Her most recent nomination came last year for her latest album, "Cantora 1." She was known throughout Latin America and Europe, with one of her most popular songs titled "Gracias a la Vida," the Web site said. "Her undeniable talent, her honesty and her deep convictions left a tremendous legacy for future generations. Admired and respected throughout the world, Mercedes is recognized as a symbol of our cultural heritage that will represent us forever," the Web site said. "She lived her 74 years to the fullest," Sosa's son, Fabian Matus, said. "She had done practically everything she wanted, she didn't have any type of barrier or any type of fear that limited her." A viewing was to be held Sunday afternoon at the Salon de los Pasos Perdidos in the Congress of the Nation in Buenos Aires, according to Sosa's Web site.